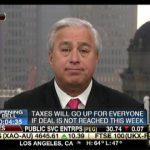 Ed Butowsky, managing director at Chapwood Capital Investment Management LLC, joins Varney & Co. on Fox Business to discuss the impact of an NFL player lockout and investing in utility stocks. The most lucrative sport in America, football, has the potential to cause NFL players to lose millions if a lockout scenario were to continue dubbed “billionaires vs millionaires”. Ed Butowsky believes there are many reasons why the lockout should be avoided, and for these reasons he believes this will be resolved without one. When you analyze the discussions between the billionaires, team owners, and the millionaires, team players, you see clearly that in reality these players represent a perishable item in the league, meaning they have a short life span in their profession. The players in the league, in this situation, really do not have much leverage in these discussions because the negotiators for the players understand that these players need their checks to sustain their lifestyle. Its been a proven statistic that if you take the top five wage earners in NFL and take them out of the league, 91% of them will be in some kind of financial stress five (5) years later (click here to read more about How and Why Athletes Go Broke). Where does the fault lie in situations such as these really lies on both sides of the equation, the players for being unreasonable and unrealistic with expectations and the investors/advisors for leading them down the wrong path and coning them out of their money. Bottom line is that there will more than likely not be a lockout because the people with the money, billionaire owners, will likely prevail in these discussions. Ed further discusses two investment vehicles to understand, one to invest in and the other to stay as far away from as possible. Firstly, a favorite of Eds, utility stocks offer a 4.5%-5% portfolio income in this market, and hence the reason its a good idea to invest in utilities. Secondly, stay away from government bonds that are interest rate sensitive. The indicators for this development is because as interest rates will go up bond yields will go down.